Payment is accepted through PayPal (pay to dirtsmart.mtb@gmail.com) and by credit card. Pay by credit card (YOU DON”T NEED A PAYPAL ACCOUNT TO PAY BY CREDIT CARD WITH THIS METHOD though it uses the PayPal system): make selection below with ‘Instruction Options/Pricing’ > Click Buy Now > Click ‘Pay with a debit or credit card…’ (bottom right) on the PayPal website. Or call me at 303-886-0288 to pay with credit card if you don’t want to use the PayPal method. When you pay, please also send me an email at dirtsmart.mtb@gmail.com noting the date of your instruction and also a good contact phone number and preferred email. Feel free to contact me with any questions: at dirtsmart.mtb@gmail.com 0r 303-886-0288, Andy. or half-day (up to 4 hrs) for $300. 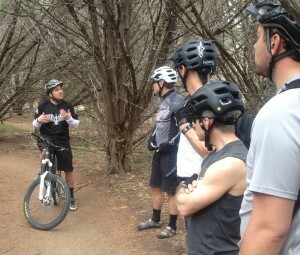 1) This is Two Full Days of all-inclusive Mountain Bike Skills Instruction (see Instruction Overview for details), covering every aspect MTB riding. The instruction will be approximately 8 hrs in duration per day (usually will begin at 9:00 am and run until approximately 5:00 pm). There will also be a Q and A regarding bike set-up after the first day of instruction concludes. We will always do a “classroom” version of any technique and/or instruction: we’ll use a very easy and controlled setting (this may be a very easy section of trail or a flat parking lot) before we take the technique out on the trail and apply it in more difficult terrain. I also use videos, photos, diagrams to more effectively and efficiently demonstrate and provide examples of technique; and, though these are by no means a substitute for real-time instruction, interaction, feedback, etc., much of this information will be available to students after the clinic is completed. The Full Instruction Camp is intended for group instruction (but may be available to individuals) and is limited to a group size of eight students. I do screen students, but am also very picky about using locations that will enable us to cater to all levels of riders, often within the same camp. This is either the first or second half of the above. The day will run about 8 hrs (usually, from approximately 9:00 am – 5:00 pm). The first half of instruction must be taken before the second. Rider’s choice on technique. Anything over 4 and less then 8 hrs. Please contact me ahead of time so we can discuss your intentions and content of the session. 4 hrs or less (anything under four hours). Rider’s choice on technique. Please contact me ahead of time so we can discuss your intentions and content of the session. This is the entire Full Instruction Clinic broken up into seven sessions (2-4 hrs in duration, per session). This is only offered in the Denver/Front Range area. Cost: $200 per session with a commitment to multiple sessions.